The 2012 Ford Edge Review: Ford introduced the Edge in late 2006 as part of its recognition that the market was shifting. Out were the boxy, heavy SUVs, and in were "crossover" vehicles. Crossovers are tall cars, on regular car unibody platforms instead of truck chassis, with sweptback windshields and more car like comfort and efficiency. Ford has sold more than half a million Edges so far. The Edge now has received a mid-cycle redo, and while the basic clean shape remains, the three-bar grille flows down like lava onto the bumper, in chrome on my car. This connects it to the look of the revised Fusion sedan. Ironically, it is also a design motif that Ford is moving away from (see the upcoming 2013 Fusion for a clue as to where the brand is headed). The interior debuts Ford's MyFord Touch system, which delivers an amazing, and at times perplexing electronic dash. Behind the steering wheel, (nicely leather-covered in my Cinnamon Metallic test car), you have a central speedometer flanked by two slender panels that you can configure on the fly to tell you what you want to know. On the left side is fuel, mileage, economy and other useful performance metrics. I set it up to show average fuel economy, and at the end of the test week, it read 20.6 mpg, a little below the 24 average Ford proclaims on its window sticker (21 City, 30 Highway). On the right side of the instruments you can view specifics of your navigation system, entertainment, phone, and other interactive features. It’s handy to have that information directly in front of you, and like the left side, if you decide you’d rather glance at something else you can select it and your view changes. The main panel in the center of the dashboard is a "home page," much like you might have on your PC or Mac. Its four rectangles feature phone, audio, navigation and climate, and give you updates about those topics as needed. Touch the edge of the box near each corner and a full screen opens where you can see, and control, features for each. That means, among other things, that the heated seats are controlled only by touch screen, no separate buttons. That takes a little getting used to, but is likely the wave of the future. The actual controls below the screen are tiny touch-sensitive buttons the size of a grain of rice. The four-way flashers (a small red triangle) are activated the same way. I accidentally touched the spot and found them flashing away as I drove down the road. I must have brushed against the control as I adjusted the radio. I’ve used similar controls in the new Chevrolet Volt, so it must be the trend. The Edge has been motivated by a nice V6 engine since it arrived, but my car featured Ford’s highly efficient EcoBoost 2.0 four-cylinder engine. You'd never know, though, the two-ton car zoomed along without a problem. That's because, thanks to turbo charging and direct injection, the Spanish-built engine makes 240 horsepower and 270 lb.-ft. of torque! That's what EcoBoost is all about, getting V6 power from a 4 cylinder engine. If you still hanker for V6 power, the standard Edge engine is a 3.5-liter Ohio-built powerplant that puts out 285 horsepower and delivers 19 mpg city and 27 mpg highway (front-wheel drive). The Edge Sport, with a 3.7-liter V6, increases performance to a best-in-class 305 horsepower and 18 mpg city and 25 mpg highway in front-wheel drive models. The new Ford Edge is an American car but it’s built at the Oakville Assembly Complex in Ontario, Canada. As a crossover, it gives you the "above the fray" feeling that SUVs do, but feels like a nice big car, not a truck. Mission accomplished. 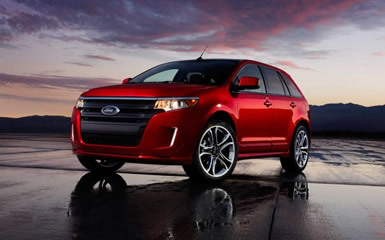 The Bottom Line: The 2012 Ford Edge is a nice mix of an SUV, station wagon and a car. The Edge truly is a Crossover Vehicle in every way. Lot’s of room, a great view, and car like handling. The Edge is the next step after a minivan and has a great option list to meet everybody’s needs. From a basic Edge at $28,000 to an All Wheel Drive, loaded to the max, $42,000 plus model, the Ford Edge has it all. With on board electronics, hi-torque motors, good gas mileage and luxury features, it make the Edge a crossover that can fit everyone’s price range in a variety of styles, colors and options.